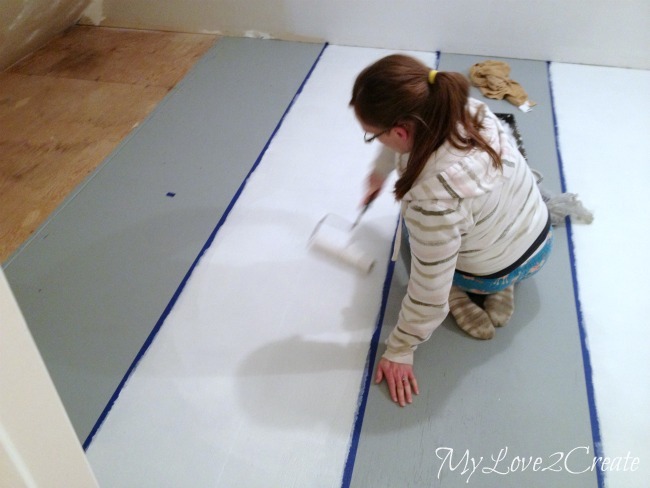 I am so excited to show you how to paint a subfloor! 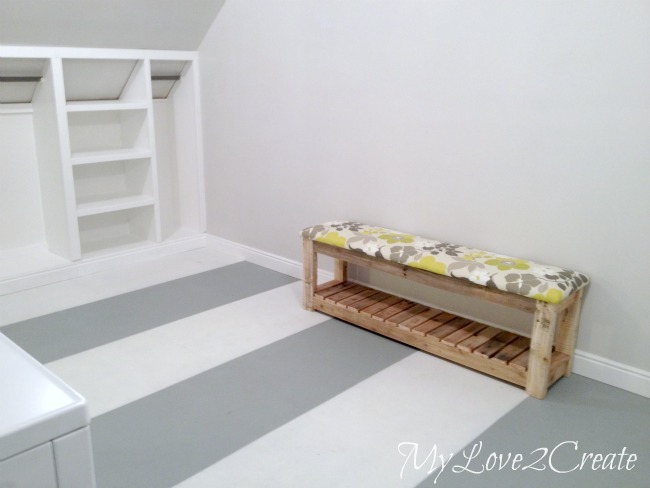 I am sure you recognize this fun striped floor from my sister's closet/laundry room makeover. If not you need to check it out! Once we finished the walls we slapped on a mistint paint (which turned out to be a mistake...we should have just bought primer, lesson learned) Of course we wiped everything down really well before hand, to get rid of all that dust. 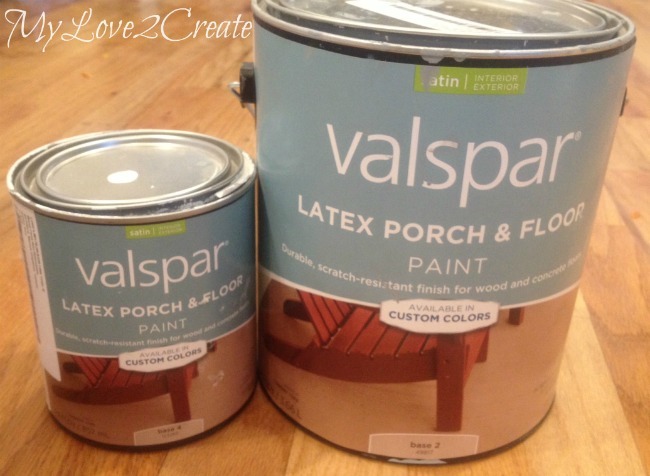 To paint the subfloor we went with porch and floor paint. It is made to withstand the traffic and does not need a top coat. That was music to our ears. With the floor vacuumed (using a shop vac and a brush attachment) and wiped VERY clean with a damp rag we were ready for paint! 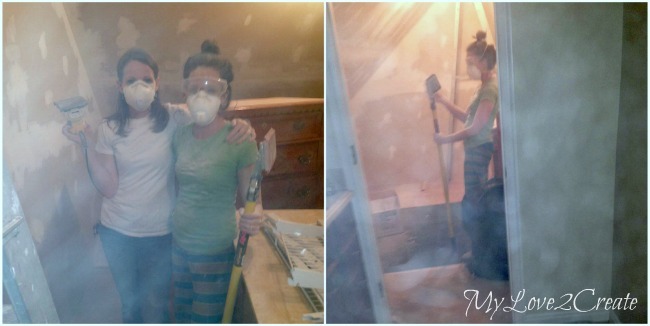 We started painting our first coat above in gray flannel. And it was at about this point that we realized that we should have done the white first....Hello?! Let's just say getting a few hours of sleep a night is probably not a good idea... So learn from us and paint the lightest coat first if you are going to do stripes. It worked out fine though, so not sure it matters. Here it is after two coats. My sister was a little concerned because it looked blue, not gray. It was because of the wall color (which we did wrong) but we plugged along anyway. Kaelynn (my sis) wanted fat stripes and so I grabbed my quilting ruler, that I love, and used it for easy measuring. It is 24 inches long, we made sure that the sections we were not painting were measured from the outsides of the tape, see the tips of the arrows above, on the "leave gray" section. It is a little shorter than the "paint white" section. Our first gray section would be covered by the built-in's so we just measured it 24''. 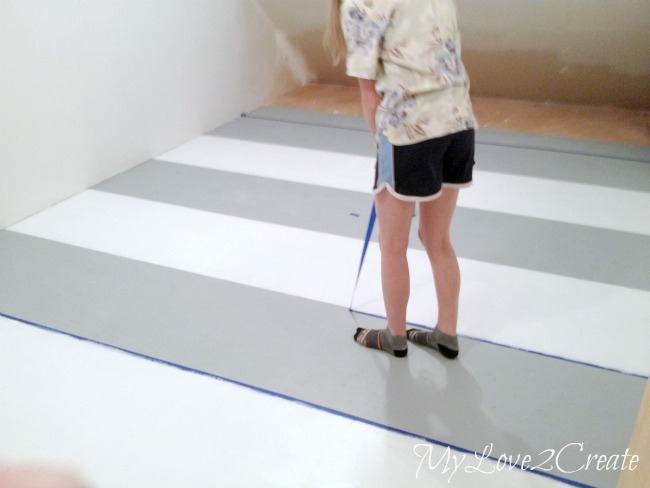 To make sure the tape was straight I would hold the ruler and my sister would place the tape, then I would move the ruler down a foot and she would line up the tape, and we continued on pretty quickly that way. It is so nice to work with someone! I felt spoiled! 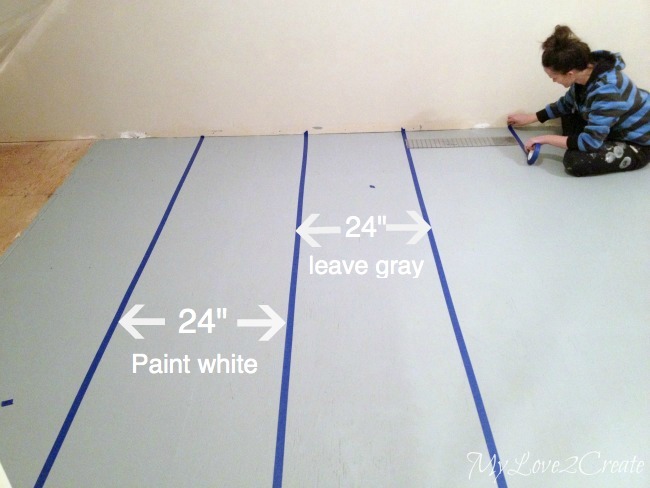 If you are doing it alone you could just mark on the floor where the tape needed to go and then put it on. Here it is, all ready for the white stripes. The random pieces of tape are a reminder not to paint that section, it seems silly, but a very important step! If you look closely I told my sister how to do the trick to getting perfect paint lines, no bleeding, and she is working on it in this picture. It works for me EVERY time and this was cheap no name brand tape. I can't take credit for this trick because I learned it from the ever awesome Mandi at Vintage Revivals. She is pretty cool, and not just because she spells her name with an "i" on the end like me. :) Anyway, just roll your tape roll over the tape ends firmly and you are good to go, you can see Mandi's video here. Simple and totally effective! Now roll on the white baby!! Oh, I mean Kathy... (another sister), and she is with child, so I guess that works...go baby go! We did two coats. I keep saying we, I did not paint except a small part of one wall, so I guess I should stop saying we...I was busy building. And, that post will be up next week. 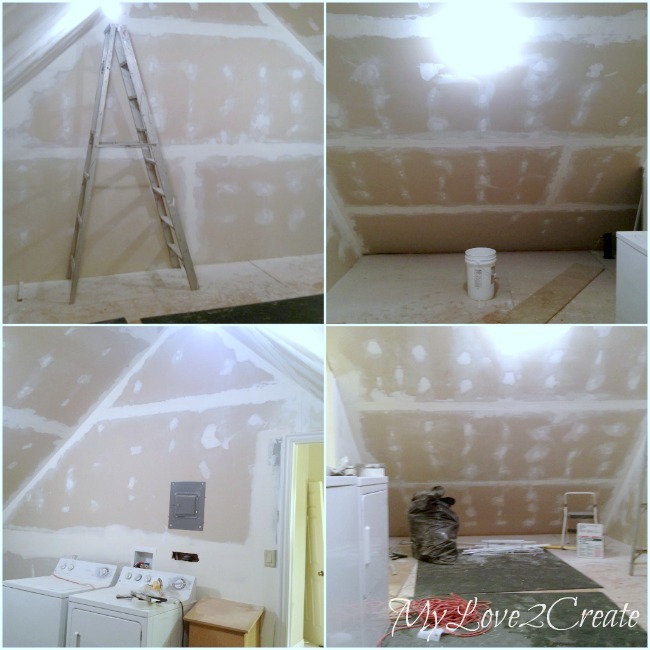 Oh, and you can see the walls have been painted over with two coats of light gray. It is starting to look good. And that is it folks! 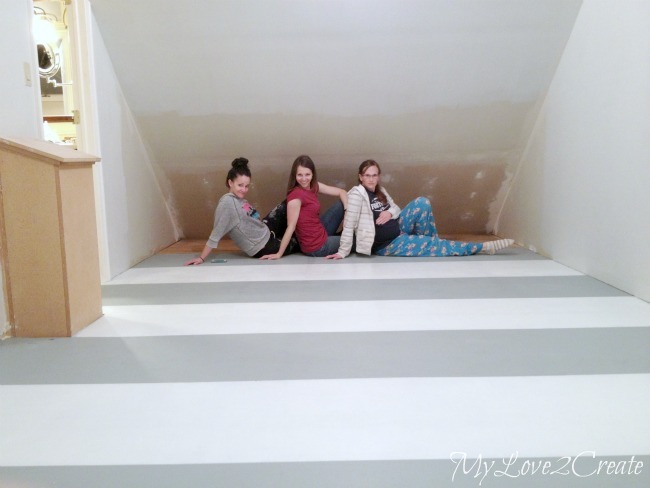 Awesome floor in no time! 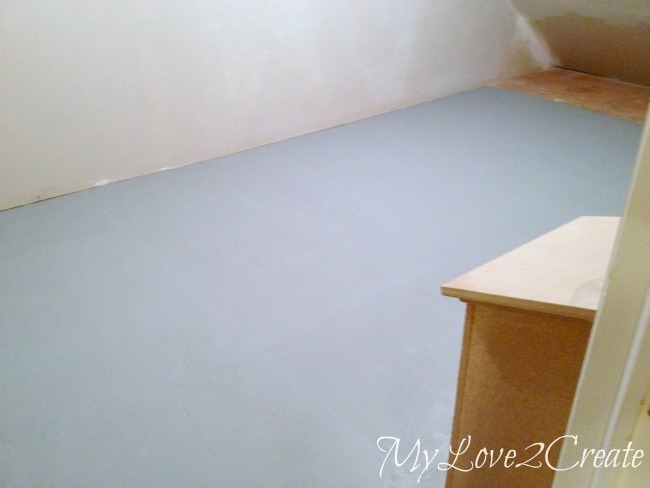 There are cure times on the paint can for heavy use, but it dries really fast and you can walk on it as soon as it dries. We couldn't help taking a photo shoot, my 13 year old took a bunch of awesome shots, this was the only non blurry one. Here it is after the slanted wall built-in's were installed, and with the DIY Upholstered Bench I made, for free! I can't get over how beautiful it is! 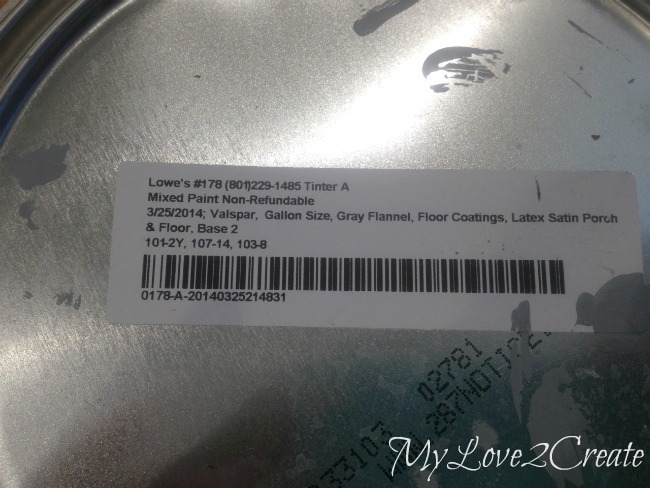 This is a painted subfloor people!! If you are super close you can see the wood grain, but even just standing and looking down it is hardly noticeable. 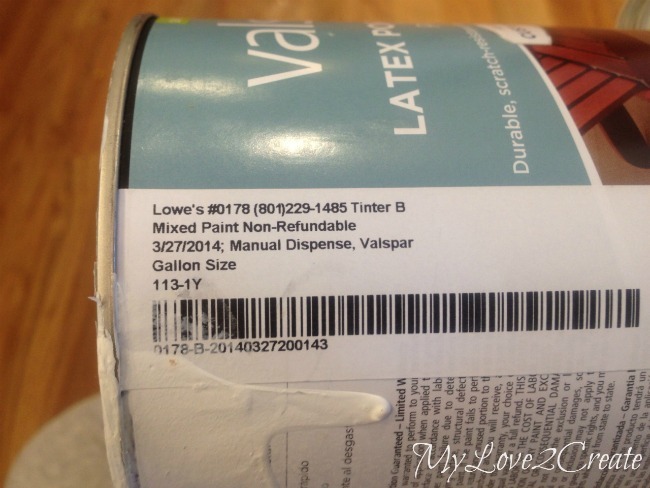 It was about $27 for the gallon porch and floor paint, and $12 for the quart size, we also bought wood filler for about $10 dollars (and didn't use all of it), and the cheap painter's tape for about $2. 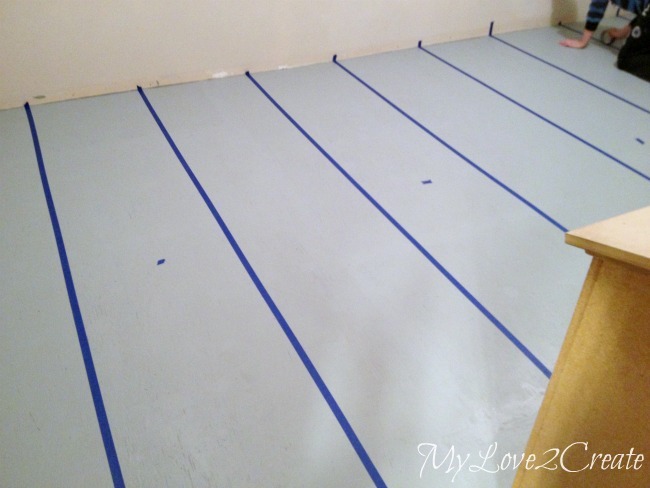 I believe we bought a couple of rollers too and so that puts this floor just under $60!! That. is. awesome. 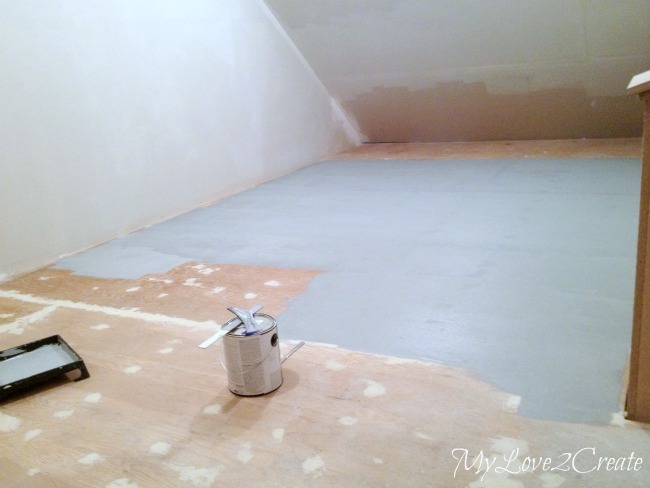 Are you thinking a painted subfloor could be in your future? I sure am! Beautifully done. I love the wide stripes rather than smaller ones, which would have made it look too busy. The floor looks fabulous! I love the gray and white with touches of yellow on the bench. Thanks for sharing at Fridays Unfolded! It beautiful and so creative! Thanks for sharing it with us! I love it! 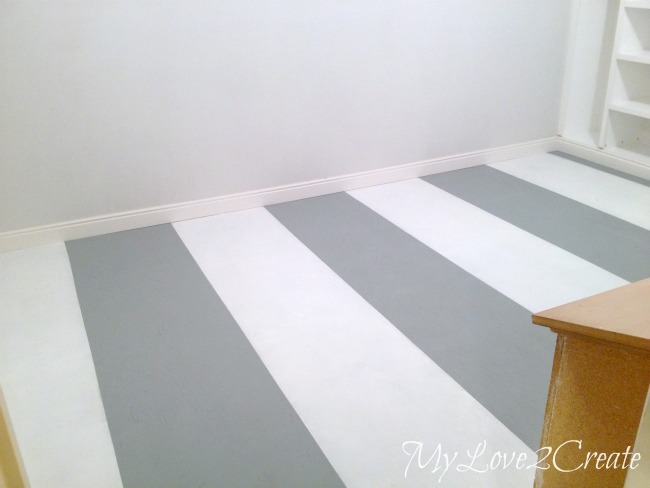 The chunky stripes and the colors were the perfect choice for the space! Wow this is so much fun! It turned out great! And the fabric on the top of the bench compliments the floor perfectly! Great job! Thanks for stopping by Creative Spark Link Party. Hope to see you back next Wednesday! 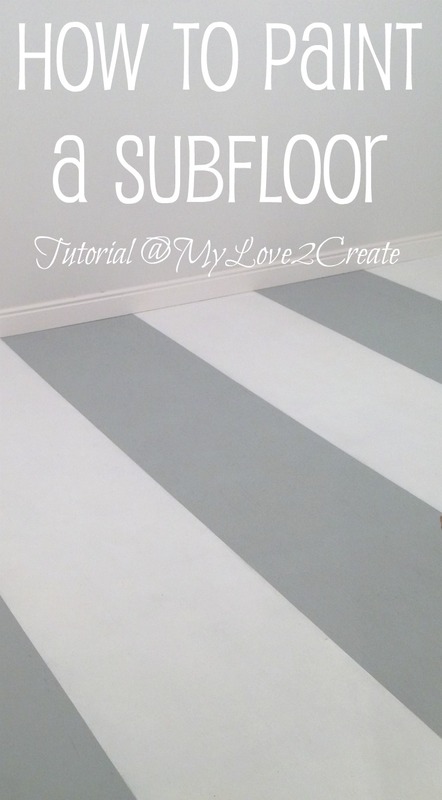 I love this tutorial about painting stripes........you did a lovely job and it came out perfect. We are working toward purchasing an old Ranch style home that has some nasty 1970 plaid glued down carpet....I think painted subfloor is in our future as a quick fix until the $$$ is available for wood floors. Wow! Great, great job! This looks amazing! Thanks for linking it up to my Creative Ways Link Party. I hope you'll be back tonight with more awesome posts! How difficult is it to keep clean? Did you use some kind of sealant on it at the end? Can you walk on it in shoes without it leaving marks? Wondering how this floor has held up??? I painted my kitchen subfloor and have not been happy with how it has rubbed off in spots even though I used four coats of paint and two coats of polyurethane specifically made for floors over the top.